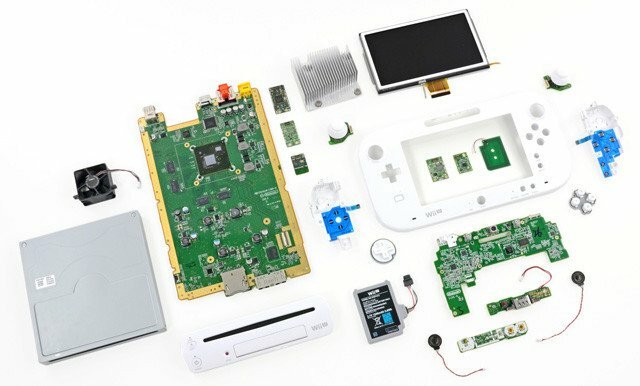 Nintendo launched Wii U Stateside this past Sunday and while some users have complained of slow performance and freezing issues - something the firm has since addressed - teardown reports suggest potential hardware breakages should be relatively cheap to repair. The heatgun and screwdriver equipped iFixit team cracked open the Wii U to discover Flash memory chips made by Samsung and an HDMI controller from Panasonic. It also concludes the components are larger than they expected, including an oversized optical drive. On a positive note, as the Wii U and its GamePad use little in the way of adhesive, so they're both easy to disassemble and subsequently patch up. Well, Nintendo boss Satoru Iwata did say the company was trying to make the thing as cheaply as possible. Of course, that will invalidate the warranty, but those confident of DIY console repair will be pleased to know the process is straightforward. Meanwhile, Nintendo has responded to console owners who experience slow performance and freezing through its Wii U troubleshooting page. "We are aware that users are experiencing load times when they launch or switch between applications. We are exploring ways to enhance features for consumers' overall experience," it promised. While frozen consoles are apparently very rare, Nintendo offers two - obvious - solutions should you be one of the few folk affected. Reset the console by unplugging it from the wall for ten seconds. Make sure the system remains current with any new system updates. Ta-da.